The following message is shown on my C5100 printer and the red light is blinking: 1. Check toner cartridge 2. Toner sensor error. What can I do to solve the problem? Thanks, Hadrian. There could be a variety of reasons for these messages. Either the toner cartridge is empty and needs a replacement, or the printer does not recognise the cartridge. Please contact our customer care team for further assistance. The Oki C5100 is a great printer which can be used for any printing situation, as the C 5100 performs at a high speed and efficiency, allowing you to produce minutely detailed documents. Use of the Oki C5100 can become limited if you’re limited financially, so a lot of Oki C-5100 printing opportunities may be missed. The Oki C5100 utilises a number of different Oki C 5100 cartridges which need to be replaced eventually and you’ll find that a lot of Oki C5100 stores charge insanely high prices for C5100 accessories, like the black Oki C5100 toner cartridge. Fortunately our discount Oki C5100 toner prices allow you to save as much as possible on all your Oki C5100 toner cartridges-just compare Oki C5100 toner prices to find out. You can rely on us for all your Oki C-5100 toner needs, so try Cartridge Save for great savings on your Oki C5100 cartridges. Discount Oki C5100 prices aren’t the only thing you get when you purchase your Oki C5100 toner cartridge from us-the Oki C-5100 cartridge also comes with free delivery allowing you to get the best value for money. The Oki C5100 cartridge also comes with a no quibble money back guarantee so that you can order Oki C5100 toner from us with confidence, knowing that we only deal with quality C-5100 cartridges or you get your money back. We’ve made the Oki C 5100 toner cartridge procurement process as easy as possible, so allow Cartridge Save to supply you with all the Oki C5100 toner you need! The Oki C5100 printer is an affordable colour laser printer built for individuals and small businesses with mid-volume printing needs. The Oki C5100 LED laser printer offers average quality prints and average print speeds, making it a good choice for those in need of an everyday printer. The Oki C-5100 prints on a wide variety of media, including banners. However, it is host based and is only compatible with Windows computers. The Oki C5100 colour laser printer is quite bulky, although it is still good for desktop operation. It is designed to work only with Windows computers, but it can be set up over a network. The C5100 Oki colour printer has high capacity paper trays, while optional paper trays can be purchased for added capacity. USB connectivity is also available for single computer use. The Oki C5100 has a small LCD display at the front panel along with control buttons for navigating through the printer menus. Versatile paper handling and the ability to print in colour are the main advantages of the Oki C-5100, giving it several points up against the competition. The C5100 printer has a 32 MB RAM and network connectivity, while duplexing comes as an option. Print quality is a mixed bag, though outputs are generally acceptable. Some online retailers supply sets of Oki C5100 laser toners as a way of offering a discount on these consumables. 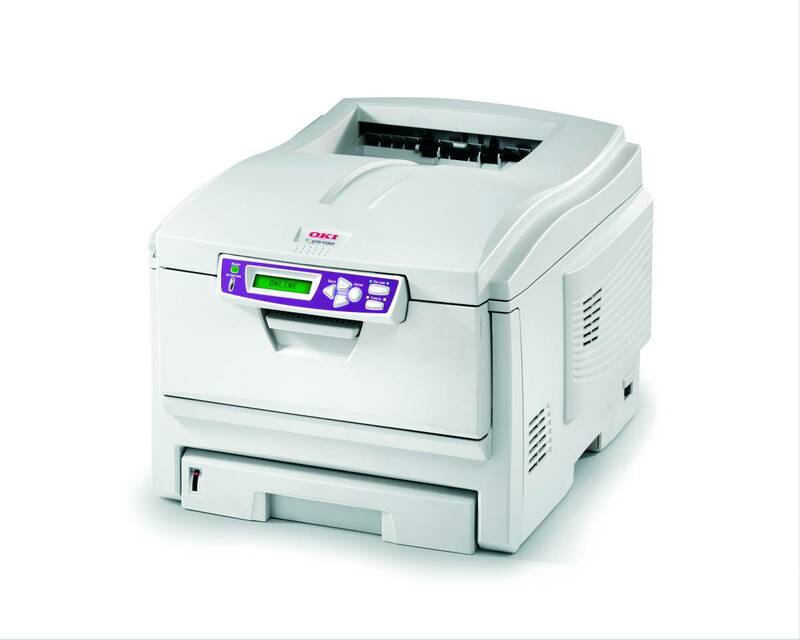 The Oki C5100 laser printer only offers average print speeds rated at 12 ppm when printing colour pages, and 20 ppm when printing in black and white. The unit also has quite a bulky frame.